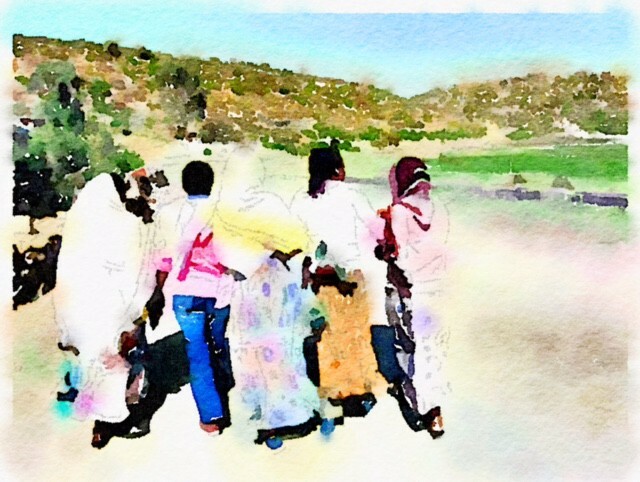 Five girls (pictured above), are all born in the same year, growing up in the same small village in northern Ethiopia. 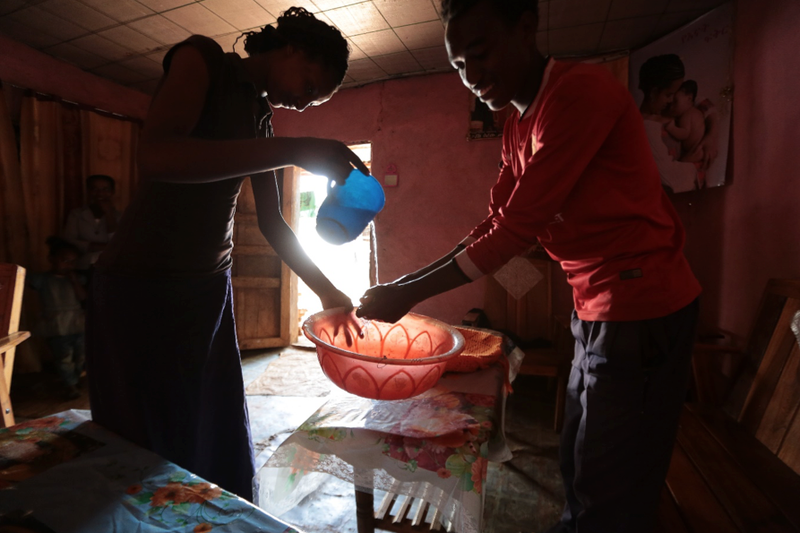 By the end of their second decade of life, two are married and mothers, two have failed the national Grade 10 exam so are looking for work and one has left her job working as a maid in the Middle East and returned to Ethiopia. How do we explain the diverging trajectories of young people who, like these girls, experienced most of their childhood during the period of the Millennium Development Goals (MDGs), and for whom poverty was a constant, though dynamic, feature of everyday life growing up? How similar or different are their experiences when compared to their parents’ and grandparents’? These questions are foremost in Young Lives long-term study of childhood poverty tracking 3,000 children over a fifteen-year period in Ethiopia. 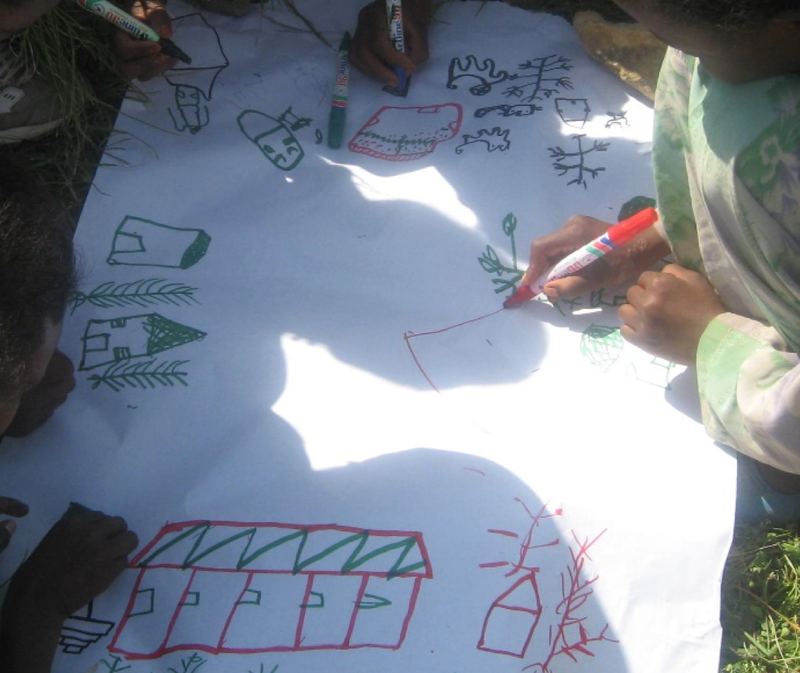 For the past decade, I have been a researcher with Young Lives where I have worked collaboratively with an international team of qualitative researchers since 2007 to track a sub-set of two hundred Young Lives children using qualitative research methods (interviews, drawing, mapping, storytelling, etc.). Longitudinal research of this sort sets out to provide a dynamic picture of children’s lives over time, a movie rather than a snapshot. Our main interest is in children’s ordinary experiences, their views and relationships, and the way they manage everyday risks in contexts of poverty. It has been exciting to observe how the study has ‘grown’ and ‘developed’ in tandem with the children as they have grown up — when we first interviewed the 1994 birth cohort at age 12 the main topics of conversation related to their experiences of schooling and work, their household responsibilities and aspirations for the future. In subsequent visits, between ages 15 and 20, new topics emerged as salient as children grew older; we began discussing marriages, babies, leaving home, and the job market — as time drew on, gender differences widened and the crushing effects of poverty and accumulated disadvantage became more apparent. Through these return visits, we document the struggles that young people face to achieve their aspirations, and investigate the kinds of support that make a difference. Young Lives didn’t start out as a study of child marriage. One of our chief concerns, however, is with how children and families negotiate differing key transitions across the whole of childhood. These are the defining moments that potentially deepen vulnerability or expand opportunities for individual children, and the points at which children’s trajectories diverge along the lines of gender and economic inequality. In several of our research sites, girls continue to marry below the legal minimum age of 18. As children became youths who became young adults, experiences of marriage, intimate partnerships, reproductive decision-making and motherhood have since become a major priority in our ongoing research-to-policy work. 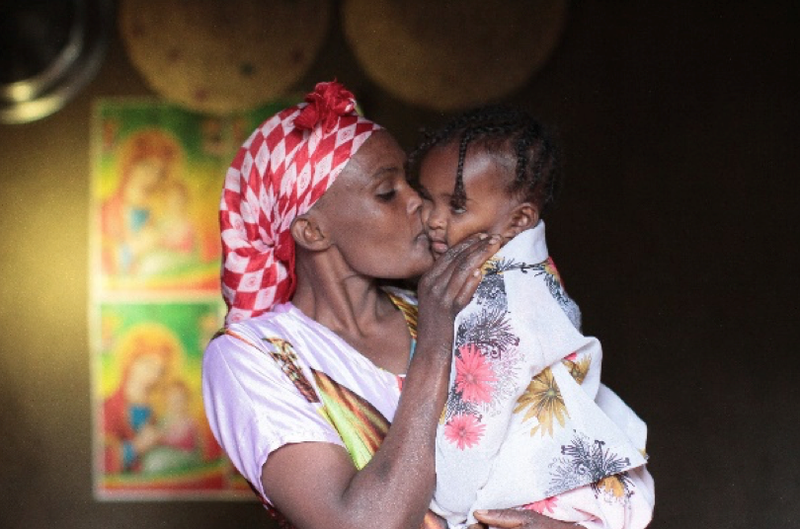 In recent years, ‘child, early and forced marriage’ has been identified as a global problem and a major focus for policy intervention, including in Ethiopia where the Government made it a priority in its 2013 National Strategy and Action Plan on Harmful Traditional Practices. Rates of child marriage and adolescent fertility have declined, but the pace of change remains slow. There is heavy campaigning around child marriage and there is a growing focus on adolescent fertility. Concerns from a development and human rights perspective centre on health risks including higher infant and maternal mortality, high levels of fertility, vulnerability to domestic violence and the intergenerational transmission of poverty. These efforts align with Global Goal 5 on gender equality which sets a target to eliminate all harmful practices, such as child, early and forced marriage and female genital mutilation. Ethiopia is often cited as one of the ‘hotspot’ countries of child marriage, though, as our studies have shown, there is significant regional variation in prevalence rates, reflecting enormous cultural diversity, and rural-urban differences within the country. In our survey study, 10 per cent of girls (41 out of 420) married before they were 18, whereas only 2 (out of 488) boys had married by that age. Few girls (7) had married before their 15th birthday. 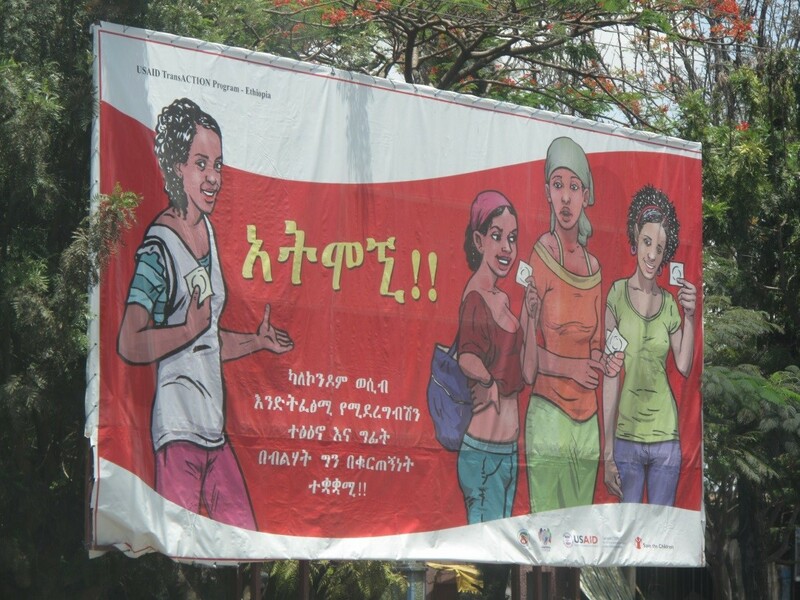 The girls who married before age 18 were more likely to come from poorer households, from rural areas and from particular regions in the country (Oromia, Amhara and Tigray). So while the overall prevalence rates are low in our sample, child marriage tends to affect some groups of girls more than others, highlighting the need to look to structural factors to explain differing outcomes for individuals. Qualitative research enables us to dig below the numbers and to explore social processes through the lens of individual biographies in context. By adding time into the mix, longitudinal research makes connections between early and later experiences and the changing contexts in which they take place. Many girls say that they want to delay marrying and having children, certainly later than when their parents married and started a family. They also value schooling and want to stay in school well into their teen years so they can earn a good living. For this generation of children and young people, it is becoming more socially acceptable to get married later and to delay childbirth, for economic and health reasons. When 19 year-olds in the study were asked ‘What do you think is the best age to become a parent?’ on average, young women said age 23 (for women) and 26 (for men). 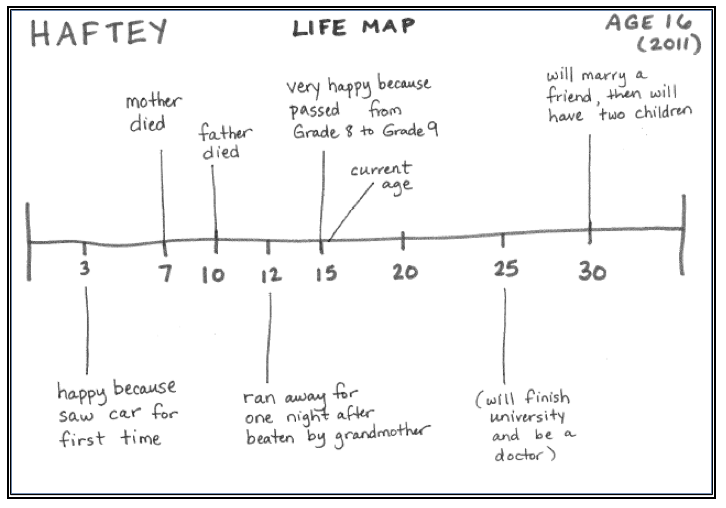 Life maps, as the one seen above were timelines created with girls and boys at different ages to facilitate discussion with them of their past experiences, current circumstances and their aspirations for the future. In Ayu’s lifemap, we discovered that many of her childhood memories were associated with illness, including malaria, a facial rash, and a chronic swelling of the neck, all of which resulted in her missing school. 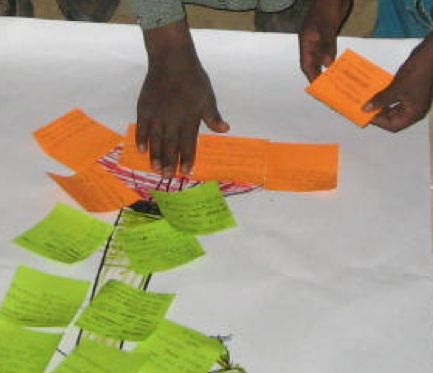 The lifemap exercise elicited Ayu’s hopes and views for the future regarding school, work and marriage. Her aspiration at age twelve was to become a teacher and she was not much interested in marriage. RESEARCHER: At what age do you think that you will get married? AYU: [Laughter] I don’t want to get married, but my parents may force me to get married… Education is better for me… [I] don’t have an interest to get married. RESEARCHER: When do you want to get married exactly? RESEARCHER: Why did you choose that age? AYU: It is not useful to marry in childhood. It is better to marry after you mature. Young Lives tracked Ayu’s unfolding biography through the course of several return visits and found that she had left school in Grade 3 after having been in Grade 2 for five years (repeating the same grade was a common problem for school children). Ayu was unable to pursue schooling alongside her long-term neck problem and her engagement in paid work which she managed alongside household chores. By age 16 she was married (apparently, of her own will, not her parents’ decision), she moved to a neighbouring town with her husband, and soon after she gave birth to her first child. By age 19, Ayu had a positive view, saying that it is good to marry early and have a child early. It is better to marry early than become haaftu (left unmarried). It is not good to give birth at a late age. An interview with Ayu’s mother found that she supported Ayu’s marriage. “Marrying after 16 or 17 is not good. We live in corrupt and dangerous times;. Many children have already fallen into bad ways. For instance, one girl I know, who is still a child, has had a baby [outside of marriage]. She suffered a lot… When you see these kinds of things, it is better that a girl marries early”. The emphasis on child marriage in policy making is as a social norm rather than a livelihood strategy. But child marriage is not just about culture, or just about poverty, nor always a forced decision imposed on girls by others. Targeting social norms to create positive behaviour change in populations is now common in development (either by promoting certain practices that will lead to norm change or vice versa). In the World Development Report 2015 themed ‘Mind, Society and Behavior’ the word ‘norms’ appears 186 times. An important contribution of the Report was to draw attention to the fact that people are deeply social and that relationships matter, a view that departs from the image of the autonomous, rational, self-interested thinker that is homo economicus. Tackling child marriage in countries like Ethiopia has also meant increasing emphasis on interventions designed to change social norms. But too often the blame is pointed towards bad choices and poor parenting, and local culture is demonised for being ‘backwards’, ‘traditional’ and in opposition to the rights of children. This obscures the wider structural factors that fail children and families — such as poor quality schooling, insufficient healthcare, lack of jobs and livelihoods and limited social protection. Indeed, in some regions and circumstances, “girls’ marriage is considered a protective practice, a way to cope with poverty, to manage sexuality and to guard girls’ and families’ reputation” (Boyden et al 2012). That is why efforts to change norms are often met with resistance, unless appropriate alternatives are presented. Within this scenario, I want to return to the example of the five girls pictured at the beginning of this piece, before concluding, and briefly explore the factors influencing their differing trajectories. The girls are Fanus, Haftey, Haymanot, Sessen and Sirnay, and together their experiences represent a microcosm of the challenges and opportunities currently facing girls in the country. Tracing their unfolding biographies illuminates how earlier experiences in life affect later outcomes, and the kinds of factors that support or derail girls’ aspirations and well-being. We start by briefly sketching out key elements in their trajectories, based on the girls’ own telling of their life histories, before drawing out two cases in a bit more detail. - Age 20, she doesn’t have a boyfriend although someone did propose to her she turned them down wants to move to a bigger town and open a boutique. - Age 19, would like to take evening classes but they aren’t available in her community; wants to find work when her daughter is older. - Will marry after earning a good income. - Age 20, remains close to ailing mother so can provide care. - No plan to return to the village to live. As can be seen from the above examples, Haymanot and Haftey report contrasting marriage outcomes at the end of their second decade of life. When they were 11 years old, they were both in school, but then a confluence of factors meant Haymanot had to leave school, and it’s at that point where their trajectories begin to significantly diverge. 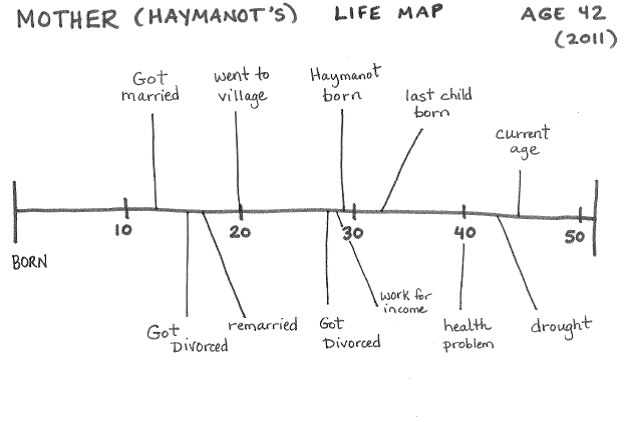 Haymanot’s lifemap (below) indicates the events and changing circumstances leading to her marriage at age 15. 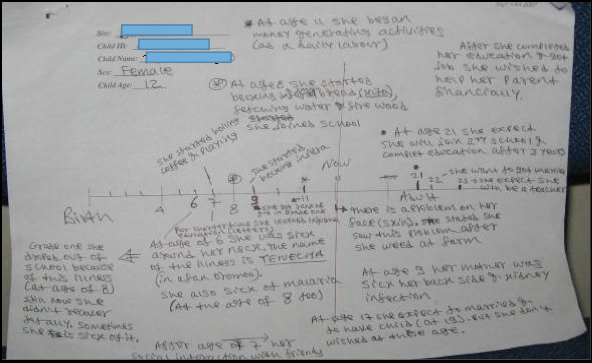 She created and discussed the timeline during an interview with a Young Lives researcher. She has an elder sister and a young brother and her parents are divorced. Haymanot recalled how she used to be a good student who ranked 2nd or 3rd in the class. When she was 7 years old she persuaded her aunt to take her in so she could join school in the neighbouring town. Her aunt’s family were better-off and she stayed with then from the 1st through 4th grades. But her mother fell ill (and would continue to suffer with a serious chronic illness) so Haymanot returned home. Although she enrolled in the 5th grade, she had to leave school because she wanted to work due to a shortage of food at home and to help her family. Age 12, she found work at a stone crusher plant (below), but carrying stones was difficult work. She met her future husband at work (he is six years her senior). Haymanot said that marriage gave her a rest from work. When she was younger, Haymanot imagined she would marry sometime between 20 and 25 years old. She explained that the reason she got married earlier was because her mother worried that no one would marry her because they are poor and couldn’t afford the dowry. In this community, the girls’ family typically transfers money and cattle to the grooms’. Her mother worried because she was ill and wanted to make sure Haymanot was taken care of — ‘no one looks to the poor for marriage,’ she said. “My dream as a mother and as what others do, is to marry her to somebody”. The man’s family were not asking for a dowry, so they felt they should accept the offer. “The problem is that we were both children and we weren’t able to manage the marriage. At the time I asked my mother and family for advice and they told me ‘tolerate it, just try to handle it’, but I refused and then came back to my mother’s”. In follow-up visits, we find that by age twenty, Haymanot had remarried and had another daughter. 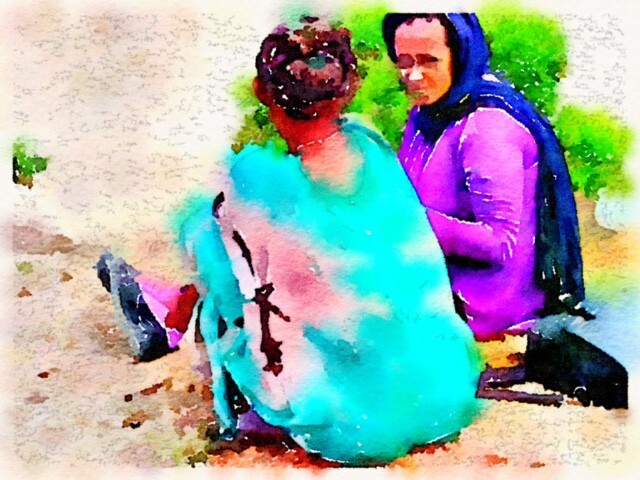 Haymanot remains close to her elder sister who believes the best solution for Haymanot is to move with her husband and children to the city where she can find paid work to improve her family’s life. Haymanot explained why she married again, saying, ‘I didn’t have any other options.’ She feels this time it was her choice to marry, even though she didn’t know her current husband beforehand. She was able to live near her mother who she continued to care for. “Now I’m married I can socialise better with my friends. I don’t go to them empty-handed. I can bring flour or bread when I meet them. I am respected because I have money. My life is better now. I now have land [from the government]. Before I had nothing”. 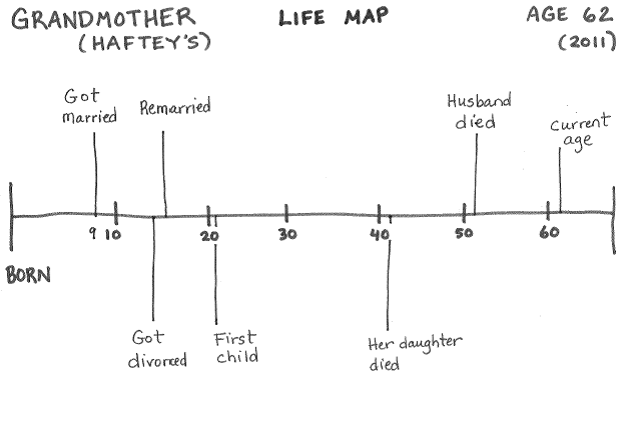 Haftey’s lifemap also indicates hardship, but leading to different outcomes. The most striking feature during her first decade of life is the death of both of her parents. In our study, 1 in 5 of all children had lost one or both parents by age 12. Haftey was raised by her grandmother since the age of 7 and she doesn’t have any siblings. She went to live with her aunt in the city so she could access a better school. “One day my relatives came for a visit from one of the Arab countries. I told them to take me back with them. I decided to go. They agreed to help me fill out the visa application and I paid for it with the money I saved from working in the garage. My family didn’t want me to go but once they knew I was going, they loaned me money for the travel”. She worked as a maid in the Middle East for two years and fortunately, her employers were kind to her. 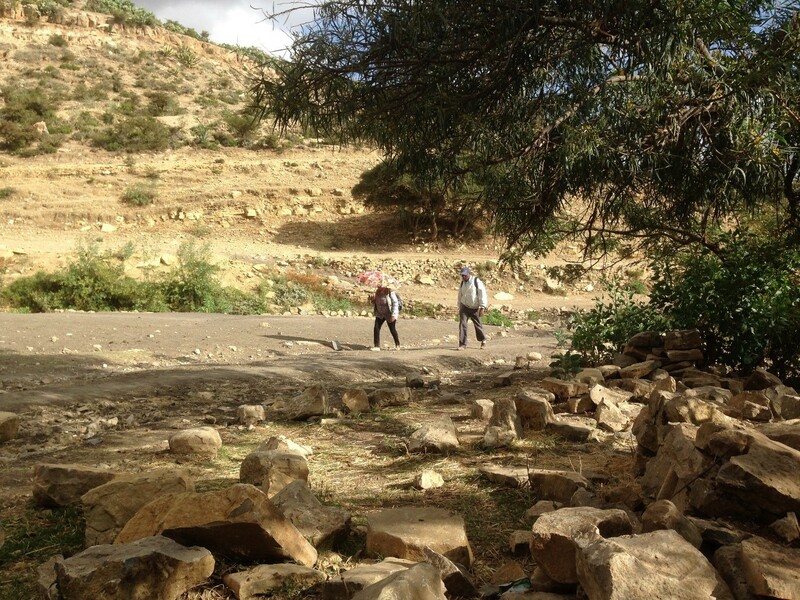 She sent money back home to her family, and she saved 30,000 birr (~$1400) for herself. She chose to return to Ethiopia when her contract ran out. “Because if I’d dropped out earlier, say in the 3rd or 4th grade, maybe they would have made me get married, and that would have ruined me as a child. For those who stay in the village soon you’ll be married. In the city it is different, they push you towards schooling. I can say that since I reached up to the 10th grade, I know myself and I can support myself. I can lead my life by working”. Haftey sees her future in the city, working, and although she wants to get married someday, she says it will be ‘to a friend’ of her choosing. Her trajectory to marriage is in stark contrast to her grandmother’s. 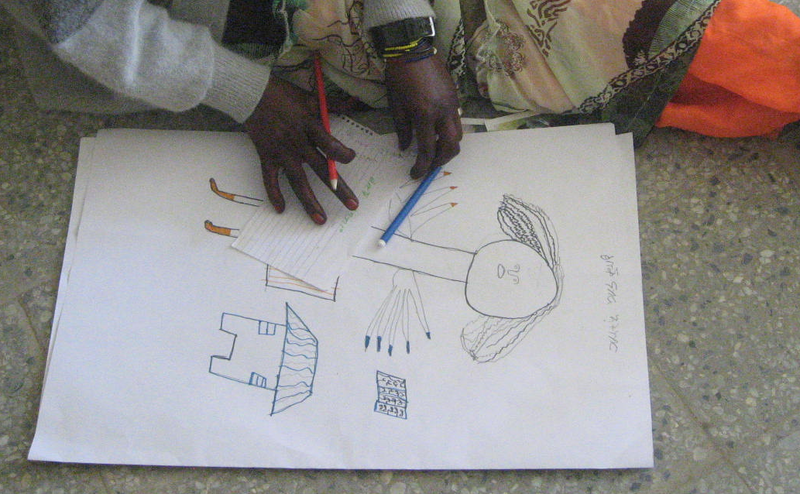 Researchers recorded life histories with children’s caregivers, including Haftey’s grandmother (below), to capture dynamics of inter-generational change and continuity. Her grandmother married at the age of 9 and divorced and remarried in her teen years. In contrast, Haftey’s focus was on schooling and later on ‘leading her life by working’. However there are more similarities between Haymanot’s and her mother’s marriage trajectories (below). 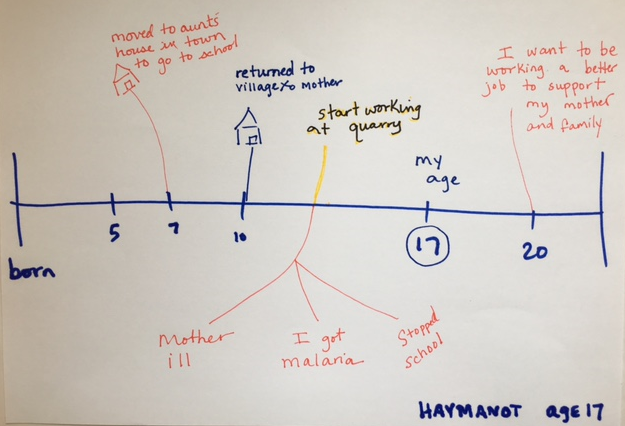 Haymanot’s mother’s trajectory also involves moving into and out of, then back into marriage following divorce. Her mother married at a younger age. And we see towards the end of her timeline where health problems and drought intersect at the precise point when the decision for Haymanot to marry is made. Certain aspects of her mother’s trajectory resonate in Haymanot’s due to the ravages of poverty and ill-health in a context of limited material and social support. Comparing their timelines underscores the ways in which lives are linked and how both vulnerability and support is negotiated across the generations. It is through time that we can begin to grasp the nature of social change, the mechanisms and strategies used by individuals to generate and manage change in their personal lives, and the ways in which structural change impacts on the lives of individuals (p. 190). The ‘texture’ refers to the social and cultural dimensions of social life (p. 189), to which I would add, the material dimension that plays a pivotal role in shaping children’s life chances. And it is how these factors come together in particular moments for children that a longitudinal perspective tries to capture. It is what Johnson-Hanks (2002:870) refers to as ‘vital conjunctures’, defined as a ‘socially structured zone of possibility that emerges around specific periods of potential transformation in a life or lives’. These are the defining moments that trigger instability and/or hope and possibility in children’s lives. It is easy to identify some of those defining moments in Haftey’s and Haymanot’s childhoods. For Haftey, it was moving to the city, failing her grade 10 exam, and then, almost serendipitously, acting on the idea to migrate for work to the Middle East. Despite being orphaned at a young age, her life was ‘textured’ with supportive relationships. While some doors closed for Haftey, other doors opened, so marriage was always a distant option for the future. Meanwhile, Haymanot had been a good student and had a promising schooling career ahead of her. For her, it was the combination of household poverty, her mother’s chronic illness and paternal absence in a context of drought that contributed to her leaving school combined with poor work conditions that made the decision to marry young both attractive and rational at the time. One of the priorities in Young Lives is to use the information we have on children’s trajectories to spot key intervention points and how they relate to each other, such as defining moments in children’s development (e.g. puberty), in school (e.g. passing an entrance exam), at home (e.g. parental ill health creating a demand for children’s unpaid care), in relationships (e.g. early divorce) and in the community (e.g. new factory attracting children’s labour), and to identify existing sources of support (e.g. social networks, sympathetic teachers, loans, etc.). Engaging directly with children and young people in research about their ‘changing lives in changing contexts’ means seeing from their perspectives what vulnerability, resilience, resistance and ‘choice’ means with respect to marrying young. Most of the girls in our qualitative study who married young had already left school. Getting married and, in particular, having a child, usually draws a line under any wishes a girl may have to continue in or return to school. While experiences in school, work and marriage are interdependent and inter-related, depending on their timing and combination, any one change can have excluding and constricting effects on other aspects of girls’ lives. Efforts targeting change need to respect the difficulties that changing practices entails for local communities and the individuals within them. Interventions need to be based on an understanding of the cultural and material logic (the ‘textures’ of childhood) that underpins practices like child marriage, and provide alternatives that meet the logic or shift it. Otherwise, interventions lack resonance and are less likely to stick. At the same time, strategies aimed to reduce these practices need to be accompanied by sufficiently-resourced initiatives to improve the health and socio-economic status of young women more broadly and that acknowledge girls’ responsibilities in unpaid work and care work within their families — this includes access to good quality, safe, relevant schooling, affordable and youth-friendly sexual and reproductive and other health services, employment opportunities, and other ways of gaining social worth and well-being in their communities. Additional provision needs to be directed to those girls and young women who have already married and who are young mothers since they continue to have hopes, plans and ambitions for themselves and their families, but lack support. In this study, we look at both girls’ and boys’ experiences over time, and marriage is but one component. Having been involved in tracing their experiences across the second decade of life I’ve come to see how their pathways to marriage look less like a one-way street leading to a single destination point, and more like a diverse field of potential pathways connected by multiple turning points and roundabouts with plenty of possibilities for diversion. 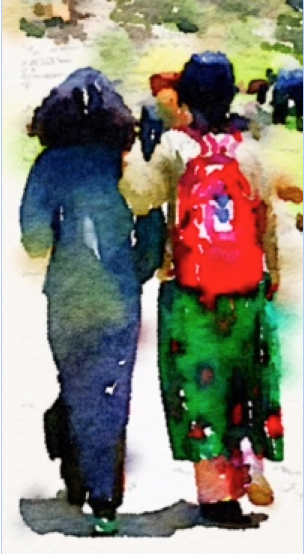 Importantly, they navigate these pathways in relationship — with others — not on their own. We are at an exciting phase in this study, when the young people are transitioning to early adulthood with new sets of responsibilities, relationships, plans and ambitions for the future. At the time of writing, research teams have returned to the field to carry out the 5th round of survey data collection with the young people and their households. The data will add yet another piece to the puzzle of the story we are trying to tell about childhood poverty. One of the most gratifying experiences for me as a researcher in this study has been to bring into focus the real people and the social processes behind the numbers and statistics. Following the children year after year has shown me that their individual destinies are not set in stone; follow-up return visits inevitably entail surprises and make us question and reflect upon the assumptions and predictions made about individual children’s trajectories. This is where the value of longitudinal research shines and, I would argue, made brighter and stronger when we bring young people’s accounts into the analysis. Photos: This digital story uses a mix of Young Lives research photos (purposefully selected and reformatted to comply with our commitment to participants not to publish their photos and protect their identity, as part of our ethical agreement) and professionally commissioned photos taken of children and youth (who consent to the public use of their photos) in similar communities and circumstances to Young Lives children. Acknowledgements: Young Lives is an international study of childhood poverty, following the lives of 12,000 children in 4 countries (Ethiopia, India, Peru and Vietnam) over 15 years. www.younglives.org.uk Young Lives is funded by UK aid from the Department for International Development (DFID) and co-funded by Irish Aid from 2014 to 2016. 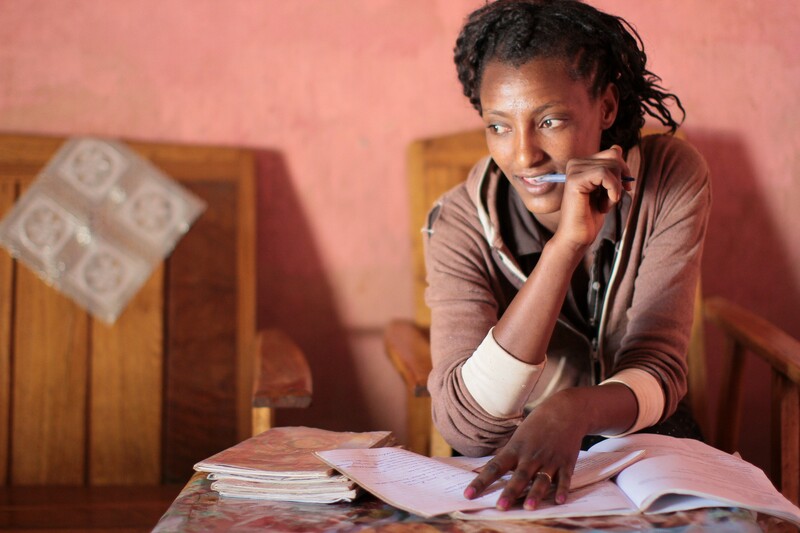 The William and Flora Hewlett Foundation funded a stream of research and policy activities (2014–2016) focused on child marriage in Ethiopia. We thank the children, families and researchers who participate, and Yisak Tafere and Nardos Chuta who lead the data collection. The views expressed are those of the author(s). They are not necessarily those of, or endorsed by, Young Lives, the University of Oxford, DFID or other funders. Follow us here on Medium where we’ll be publishing more articles soon. If you liked this article please click the green heart, it really helps to spread the word and let others find it. Ready for more? Try our articles on Imagining the future of healthcare, The future of work and How do you design the library of the future?. Produced by Jessica Turner, Digital Communications Office, University of Oxford.